Nova Scotians are about to receive a flicker of power from North America's first in-stream tidal turbine. On Nov. 7 Cape Sharp Tidal, a partnership between Emera and OpenHydro/DCNS, deployed the first of two 1,000-tonne two-megawatt turbines at the Fundy Ocean Research Centre (FORCE) in the Bay of Fundy’s Minas Passage and today, it was connected to Nova Scotia Power’s transmission system. The turbine will help power 500 homes. A second 16-metre turbine will be lowered into the surging tides in 2017 and complete the first phase of a commercial-scale tidal energy project at FORCE, which aims to produce up to 300MW of power in the 2020s. FORCE is a non-profit organization that provides a testing site for tidal technology in four underwater, 200-metre-wide berths (the only sea floor in Fundy with a Crown lease for energy development), and doubles as a research institute with an environmental watchdog mandate. 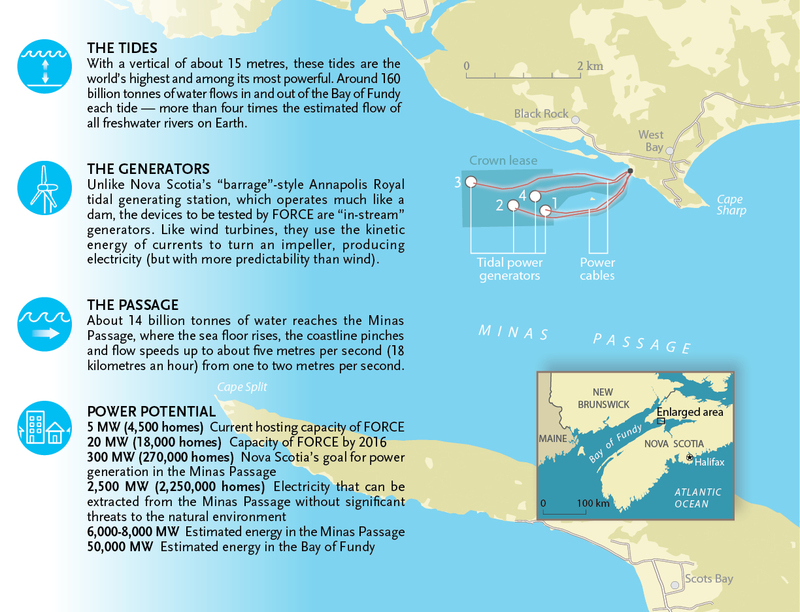 These infographics, adapted from a larger piece that appeared in Canadian Geographic’s July/August 2015 issue, depict the four tidal-power prototypes (including the Cape Sharp Tidal turbine) that had been signed up for testing at FORCE at the time of the magazine's publication, and where they were set to be deployed.